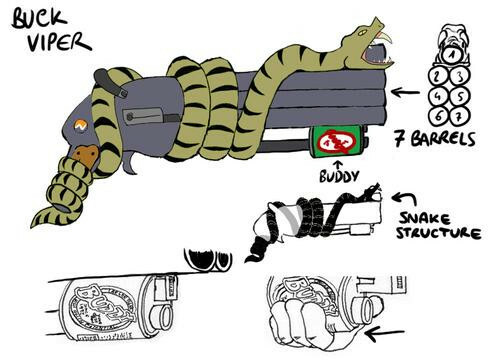 Here we have the Buck Viper, a septuple-barrel shotgun with a live snake coiled around it. As you can see, the top barrel is inside the snake’s mouth. The forestock is also a Buddy Beer can. Nobody seems to understand how this gun can function with a design that doesn’t make much sense. That of course hasn’t stopped the army from mass-producing them. They are quite powerful and appropriately a step above the standard-issue Razor Blood. This picture is posted under fair use. All rights reserved to their respective owners. This entry was posted on Monday, February 7th, 2011 at 7:27 am	and is filed under Main News.